East Hampton Town Supervisor Larry Cantwell declared a local State of Emergency for East Hampton Town on Oct. 26, in an effort to combat and manage an outbreak of Southern Pine Beetle infestations in a section of Northwest Woods. “The threat of tree loss from pine beetle infestation of pitch pine forests is great where an outbreak spreads rapidly during certain times of the year. The adult beetle tunnels through the tree underneath the bark, killing the tree in two to four months,” said East Hampton Town Supervisor Larry Cantwell in a press release announcing the state of emergency. “The Town of East Hampton has declared an emergency given the current outbreak of the pine beetle across a significant and growing area of the pitch pine forest in a part of Northwest and the threat to the outbreak spreading further,” he added. 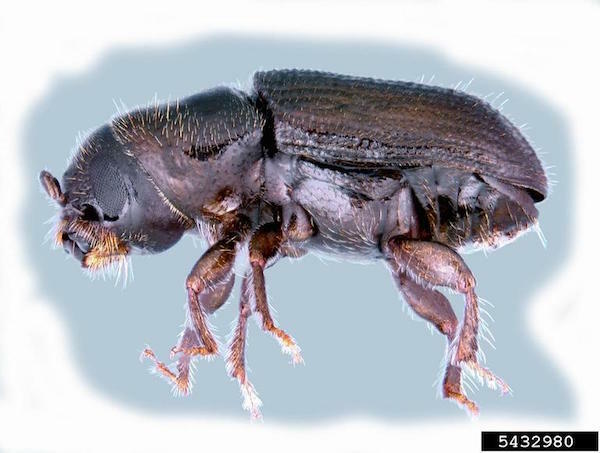 Currently, the Southern Pine Beetle infestation is present on both public and private properties, where it is currently estimated more than 2,000 trees are infested, according to the town. The town identified 800 trees in need of felling to control the pine beetle earlier this month in a 6.5-acre town-owned property off of Swamp Road in Northwest. The town board signed off on a resolution spending $16,000 to fell the trees on Oct. 10, and had applied for a grant from the DEC to cover the estimated $80,000 cost of the felling of those trees. Because of the need to control this infestation from spreading, the town has begun an emergency program to cut infested trees to the ground (the recommended management technique) on public property. The town will also be providing assistance to homeowners from private tree contractors, enabling willing private property owners in the area of the infestation to fell infected trees. This assistance program will provide tree cutting to the ground for infested trees that have a likelihood of spreading infestation to other properties, as identified by Land Management. Details on the assistance program can be obtained by contacting the Land Management Department 631.324.7420 and scheduling a site visit. The New York Department of Environmental Conservation also has information about pine beetle infestations, online here. Drove through there after reading your article, They have tagged almost every pine tree in the whole six acreas. Hope this does not mean everyone must be destroyed.